Peck, Beatrice L., 95, passed peacefully Saturday, May 14, 2016 at Sturdy Memorial Hospital. Born in Attleboro, she was a daughter of the late Alfred and Leonie (Lebeau) Veillette. She had lived in Attleboro all of her life and was married to the late Edward A. Peck, Jr.
Bea worked for the City of Attleboro in the Public Works and Water Departments for 15 years before retiring as a senior clerk in 1982. She was a member of the Attleboro Historic Preservation Society, Friends of the Public Library, a former member of the Union of Prayer of St. Joseph Church, and a member of the Retirees Association of Attleboro. She was a former member of the Attleboro Girl Scout Council, Den Mother and Brownie Leader. 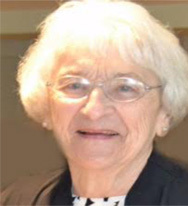 She was a recipient of the Historic Preservation Award in 2011. She leaves a son, Edward A (Anne) Peck, III, PhD. of Richmond, VA, a daughter Jane A. (James) Stapleton of Cranston, 5 grandchildren Sally (James) Ashby, Lea (Matthew) Gray, Gary (Kristen) McKearney, Jr, Christine (Matthew) Marcotte and Ryan (Emily) McKearney 12 great grandchildren, Brittney, Gianna and Jayde D’Agostino, Tristan Marcotte, Noelle, Patrick and Emma McKearney, Miranda McKearney, Sarah Blais, Jared DuBois, Lucy Ashby, Jackson Gray and many nieces and nephews. Her life will be celebrated with calling hours Monday 5-8pm in the Foley-Hathaway Funeral Home, 126 South Main Street, Attleboro Ma 02703. Funeral Tuesday at 9:00 am followed by a Mass of Christian Burial in St. Vincent de Paul Church, 71 Linden Street, Attleboro at 10:00am. In lieu of flowers donations in her memory may be made to the Attleboro Public Library 74 North Main Street Attleboro, Ma 02703. Burial will be in Oak Knoll Cemetery, Rehoboth MA.